It was in 1928 that the last medicinal cannabis prescription was written in the UK. On 1 November 2018 medicinal cannabis was legalised on prescription after families of children with severe epilepsy called for change. The shift in attitudes and understanding of medicinal cannabis reached a crescendo in June of 2018 after 12-year-old Billy Caldwell, who has severe epilepsy, was admitted to hospital after his CBD oil was confiscated. Following Charlotte Caldwell, Billy’s mother, and other families’ high-profile campaigns, Home Secretary Sajid Javid allowed a special licence for Billy. A simple change in the law has made a positive lasting impact for Billy and other families in similar situations. One such family includes Steph and Dom Parker and their eighteen-year-old son Max. 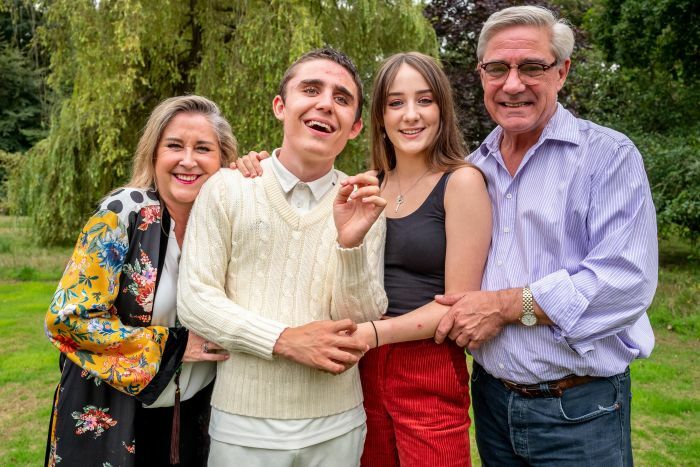 Best known for their hilarious time on the successful Channel 4 show, Gogglebox, the couple is now preparing to release an hour-long documentary of their journey investigating the use of CBD oil: Steph & Dom: Can Cannabis Save Our Son? “We felt that, as we have found ourselves in a position where we are known, there was no greater opportunity than this to spread awareness of both epilepsy and autism. “We also hope to dispel any myths or pre-conceptions that may exist in regards to the illnesses and the drug,” explains Steph. Set to air on Channel 4, at 9pm next Monday, January 28, the documentary will see Steph and Dom, alongside their daughter Honor, travelling the world speaking with families who have been prescribed CBD oil to discover success in certain cases. It was when Max was just four months old he received his epilepsy diagnosis, the family learned he was autistic several years later. “Max unfortunately is in the rare group of sufferers that can experience up to 130 seizures a day – particularly at night,” continues Steph. As a tight-knit family, Steph and Dom are determined to do the best for Max – just like any parent would for their child. This is where the idea to discover more about medicinal cannabis was born. With families across the UK, Northern Ireland and beyond reaping the benefits of the drug, Steph and Dom wanted to learn more. Steph enthuses: “Medical cannabis has been in our awareness for almost a decade. We have discussed this at length with Max’s consultant so we have been following the documented process of medicinal cannabis. Steph continues: “The recent cases highlighted in the news in 2018 have shone a spotlight on the possibilities that medicinal cannabis may have to offer sufferers of many illnesses. So, it was a very natural decision on our part to try and discover exactly how it might affect Max if he were lucky enough to be able to take it. It is not just epilepsy and subduing the number of seizures that medicinal cannabis can help with. Many people with chronic illness, multiple sclerosis, and similar conditions have detailed the benefits of using medicinal cannabis and CBD oil. At present, a prescription will only be made available to adults and children with severe epilepsy or adults experiencing side effects of chemotherapy. Although there has been widespread celebration at the introduction of medicinal cannabis, it is not yet regulated within the UK meaning dosages are not yet consistent. Within the documentary, Steph and Dom discover the highs and lows, positives and negatives, that come with medicinal cannabis. However, it is a drug that the couple believe can, and could, work for Max and others. “We are aware that the process of bringing a new drug to the market is a very lengthy and complicated one,” says Steph. “As such, the information we gather can change very quickly. Whilst working on the documentary the family endured an emotional rollercoaster, reliving the moments over the last fourteen years of Max’s journey alongside the false hopes and dashed dreams. It is a documentary that will shine a very important and distinct light on epilepsy, autism, and medicinal cannabis. “We felt it very important to show what living with this disability is actually like, and thus we have exposed ourselves and our lives completely to this end. “We open the debate on what medicinal cannabis potentially may or may not do,” explains Steph. The honest and open approach will, surely, delve into the unknown and advance awareness with the experiences of Steph, Dom, Honor and Max, alongside other families at home and across the pond. Learn more about medicinal cannabis by visiting the NHS. Charities including Epilepsy Action and Young Epilepsy can provide further support.